Today I’m writing from snowy, cold Utah! Before traveling here, I snapped a few photos of the skincare I would be packing for this trip & I’m so glad I brought extra moisturizing ‘stuff’ because it is so much drier here. Ever since doing Accutane I get a lot of questions about how my skincare changed after that and basically, it just never went back to being super oily. It is mainly just dry now. I’m a major product junkee – like I’ve bought every skin care product on the market for dry skin, large pores, to get glory skin, etc. and so far this routine has been what stuck with me! Also – keep in mind I am pregnant so no retinol right now! 1. MAC Cosmetics Makeup Wipes: Hands down my favorite wipe. They smell so good and take off all the stubborn makeup super easily. When we landed in Utah, I went straight to the Nordstrom MAC counter to get a travel size because I didn’t want to pack my huge package. These don’t irritate my skin & it doesn’t take a lot of rubbing to get any product off. 2. When I am home I use this Tula Facewash but when I travel I use this Philosophy face wash. Both are gentle & effective – and neither cause breakouts. I always use my little pink Clarisonic with this product to get all of the leftover makeup off. I don’t use my Smart Profile Clarisonic anymore really – mainly just the travel one bc it has less power and doesn’t seem to dry out my skin. I’m hanging on to my Smart Profile though because I know my skin will change after baby and I may get oily and need it more! 3. Next, I use Baby Wash to get my mascara and eyeliner fully removed. I’ve mentioned because how much I love this – it doesn’t burn your eyes, but it also strips away all of the leftover makeup. It is very gentle but also quickly gets off the waterproof liners I wear! 4. As for eyes, on days where I am actually going to wear makeup and get fully ready, I apply a tiny bit of THIS to my under eye area. I’ve been using it for a while and really like it because it makes my eyes feel more awake and also works to brighten them and reduce lines. The key I think though – for eyes anyway- is using something crazy moisturizing at night! The only eye cream I use at night is THIS one by Tata Harper. I wake up my and eyes still feel like the product is there. I know I’ve said it before but moisturizing that eye area is a huge deal for keep them from getting tired/aging/puffy looking eyes. This product is rather expensive, but it actually lasts a year bc you don’t need much. I use this nightly instead of 2-3x a week like the recommendation. 6. Okay, last but not least.. and not cheapest.. is the moisturizer and concentrate. Honestly, I was not a huge believer in La Mer. I tried it before Accutane and hated it. Now that I am dry, I tried it again and I actually liked the heavy cream. I didn’t buy it though until it got super cold in Tulsa and it was the only thing that got rid of my dry patches. The concentrate is not necessary if you have normal skin – but I like it because it does calm down my dry and helps it heal. For me, the heavy cream is worth it – I love how my skin and makeup look when I use this and my skin stays so soft and plump! Okay! That is is for now!! Hope this helps answer some of your questions. Love the purity and tula face washes! I need to try out the baby wash trick! 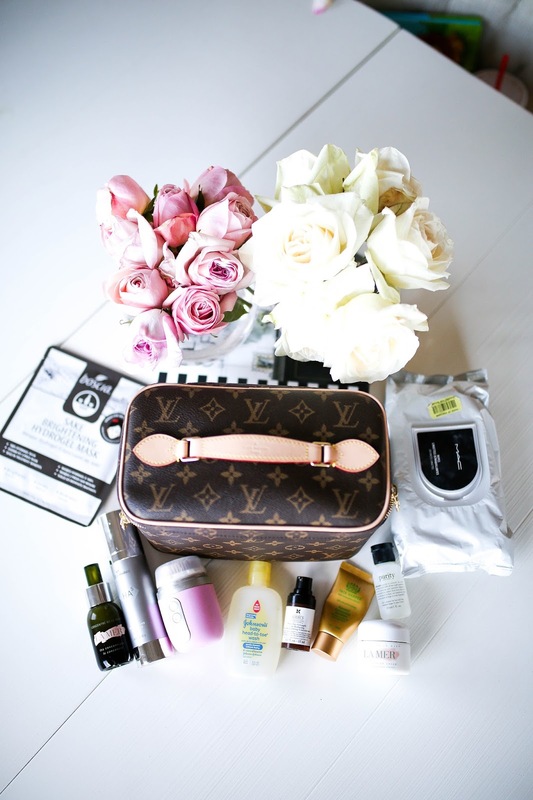 As a huge Louis Vuitton fan, I love your makeup bag so much! 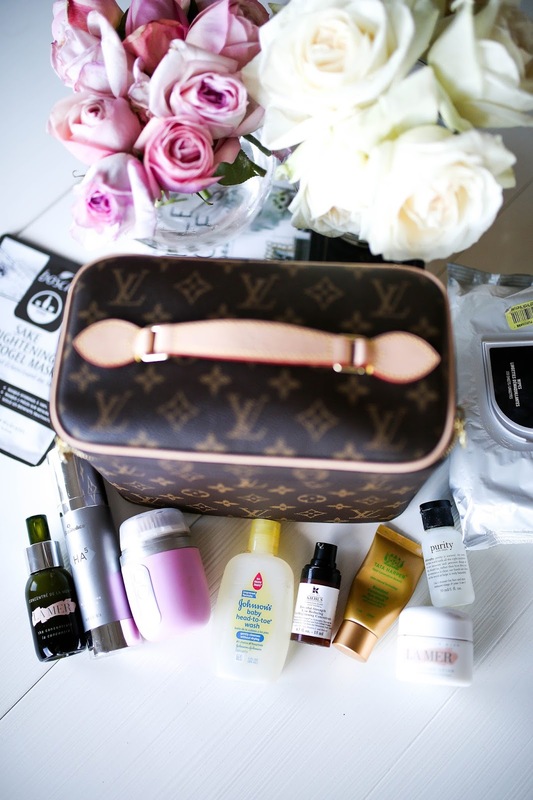 Great tips, I have wanted to try a Lamer cream for forever…but the price always stops me. May I should give it a try. Thanks for sharing your tips on what to use! My skin is soo dry so I will definitely trying out some of these things! I started using baby shampoo for eye makeup remover and it is the best! I hate hate hate (and makes me cry inside) when lashes fall out from wiping mascara off. Any suggestions on a more gentle way? I have never used baby wash to wipe off mascara and eye liner. I need to try it out! Thanks for the great tip! But I must try the baby wash, thanks for the tip! I rely heavily on makeup wipes, so I'm definitely going to try the MAC ones! Your skin looks flawless, and now I see why! 🙂 I also love La Mer moisturizer, it's amazing for skin, mostly now in the winter. I love La Mer's products! Their foam wash is also super good 🙂 I've never thought about using baby wash for eye make up – I'm going to try it! Gosh, I'm dying over the makeup bag!!! Have to put that on my wish list for sure!! Love all your advise and its VERY helpful. Keep them coming. Safe travels and can't wait to see the post of Baby Gemma room! Loving your skincare picks! I definitely need to up my game! What is it about the Sephora masks that makes it so you wouldn't recommend them? I've tried some recently, but I also picked up loads of other brands, so I'm curious as to how you compare them. Can you go over all of your Louis Vuitton items? I would be interested on what you think is worth it! I love your makeup bag. Love this post! So pretty and so practical!!! Hi Emily! I did one round of accutane at the end of high school but eventually my acne came back. I am 26 now and was wondering at what age you did accutane and if it only took one round for your skin to clear? I am considering trying it again. Thanks! I have been trying to research really good skincare products and love your routine! 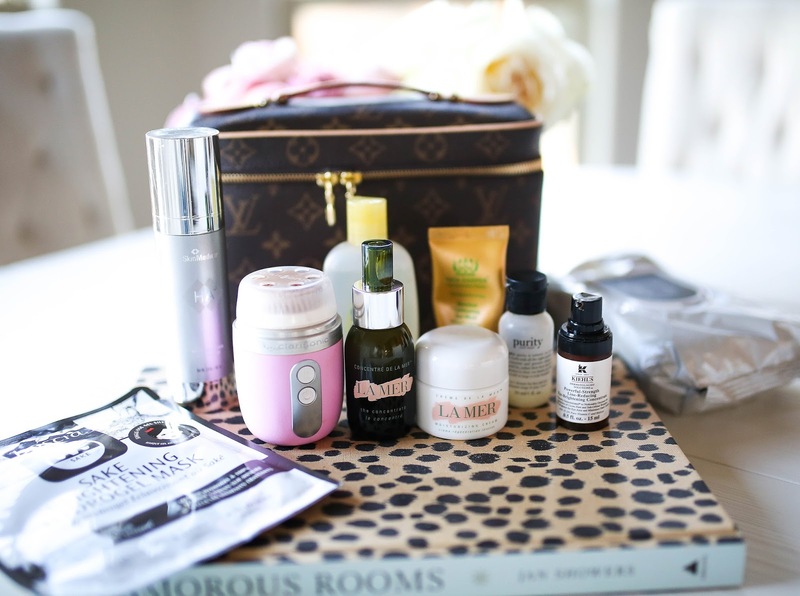 I always love all of your skincare picks! 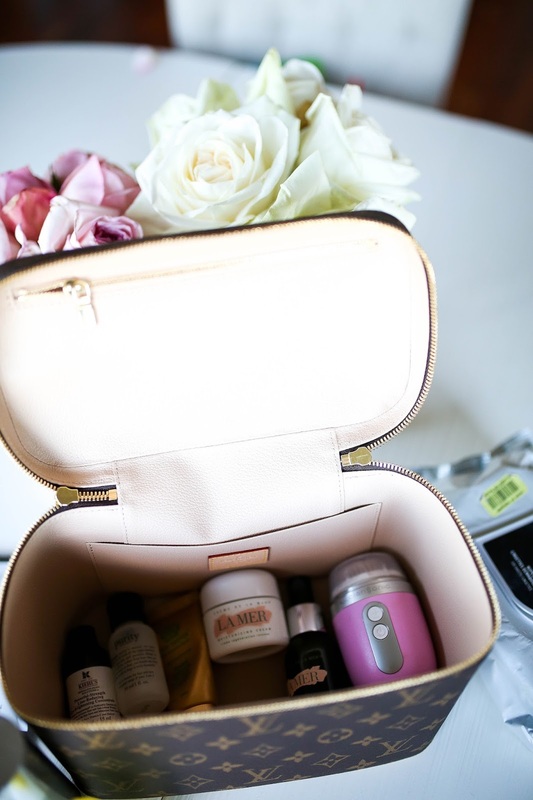 Your makeup bag is sooo pretty! Love LV. You routine sounds good, maybe trying some products from the list.